ProcoverPlus is the only aluminized heat reflective propane tank cover today that keep propane tanks safe for your family, the environment and our brave firefighters. Inventions grow out of necessity and this one is no different. The problem is that propane tanks will vent propane when they get hot and when they do there is the likelihood that a fire or explosion will occur. The Wall Street Journal estimates that there are approximately 5,300 such accidents each year. I was made aware of this when I read about one grilling accident in the San Francisco Chronicle. In that article the victim was quoted as saying, “I remember could hear my skin sizzle”. With that vision in my mind and with my engineering background I knew immediately how to solve the problem. The answer is to cover the propane tank with a heat reflective aluminized cover. In fact my covers are made out of the same shiny material that is used by firefighters to protect themselves for heat inside a burning building. I initially developed the covers out of a concern for the safety of families. I couldn’t even begin to think that some child could potentially get burned from a venting propane tank when I had a solution. In the process of developing the covers I also learned that propane tanks will vent just from sitting on the deck in the hot sun. Now instead of safety there becomes a concern for the environment. Imagine 10’s of millions of propane tanks around the country all spewing out a little bit of propane day after day. Propane is a Volatile Organic Compound or VOC and when vented it becomes one of the key ingredients in smog. One source estimates that there are as many as 336 million pounds vented annually. As I dug further into my propane research I discovered another little known fact that is a major danger to firefighters. It is called a BLEVE or Boiling Liquid Expanding Vapor Explosion. 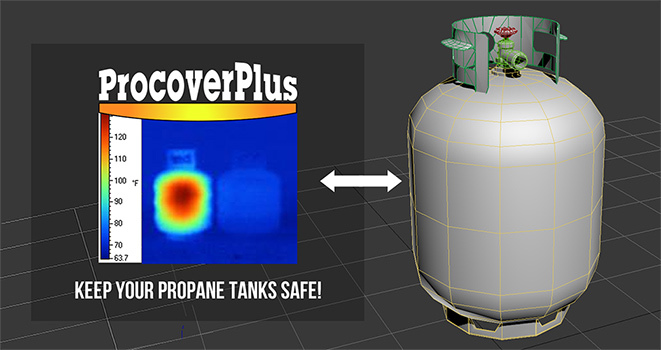 One should never store a propane tank inside a building but millions do, especially inside the garage. When there is a house fire the intense heat from the fire will cook the propane faster than it can vent the propane and the tank will explode. When it explodes from the pressure it fills the building with propane which then ignites and causes a second larger explosion which can collapse a building killing or injuring any firefighters inside or near the building. My cover prevents this from happening. When I first began this project a number of years ago crowd funding didn’t exist, it was either self fund or find an Angel investor or venture capitalist. Recently I had the good fortune to meet several entrepreneurs who had run successful fund raising campaigns and they shared those experiences with me and this website is the result of those conversations. Protects you, your family & the environment from potential harm. Made from the same material used to protect spacecraft and firefighters from heat. Keeps the propane tank on your gas barbecue grill cool & looking good. Reduces the heat absorbed by the propane tank by up to 1800%. Low cost & easy tool-free installation. I need your help to bring the ProcoverPlus cover to market and begin protecting families, the environment and firefighters. Any contribution will help, I have a $5 and $10 option and a $25 pre-order option. Think of it as investment in your family and friends and grand kids safety. Why Use a Metalized Cover? The reason is Called Emissivity! It is commonly believed that if you paint something white it will be cooler, in fact numerous agencies and codes call for pressurized fuel tanks to be painted white. The fact is that paint (the hydrocarbon molecule) is a very good absorber of infrared energy. It is also this infrared wavelength that is responsible for the vast majority of the energy that heats things up, like propane tanks. The belief that a white painted surface will be cooler than say black painted is true. If you were to paint something black, for a 8-14 micron infrared wavelength it would absorb about 95% of the energy that hits it. The same surface painted white would absorb about 92%. The reality is that this isn't really that much of a difference. An unpainted rusty tank absorbs 82%, but a tank with the heat reflective metalized cover absorbs ONLY 5%. That amounts to a 1800% difference! That is why you want to use a metalized cover for these pressurized fuel tanks. It is also why the same material is used by firefighters in their firefighter suits, and industry uses it for heat protection in numerous heat-related applications. Tank on left had no cover. Cooler tank on right had cover. Two propane tanks were placed near a high radiant heat source for 5 minutes. The tank on the left did not have a cover. The tank on the right had a standard ProcoverPlus heat reflective cover. 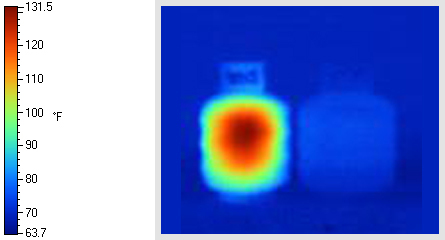 The cover was removed from the tank on the right immediately before the image was taken so that both tanks would be imaged with the same emissivity. The image shows that the tank that had the heat reflective ProcoverPlus cover is substantially cooler than the tank without the cover. Ambient conditions: The above image was taken on a cool (62F) windy day and was kept to a 5-minute exposure for safety concerns. 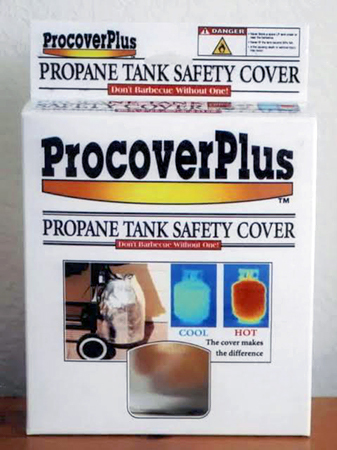 It indicates that there is substantial protection provided by the cover and also indicates that on a hot calm day an even greater temperature rise would occur for the uncovered and unprotected propane tank. I started thinking about my product when I read the newspaper story about an accident victim being quoted as saying, “I remember I could hear my skin sizzle.” It was a visual image that was literally burned into my brain. Later the Wall Street Journal ran an article, "Gas Grills: Faster, Cleaner, More Perilous". In that article a few statistics stood out, one was that there were 5.3 million propane grills sold annually (now closer to 9 million) and that there were 5,300 propane grill accidents reported each year. With the information above I knew there was a problem, I knew I had a solution and I knew the size of the new grill market. My plan was to patent the cover, contact the BBQ manufacturers and license it to them. Well it didn’t take long before I realized that no one in the propane tank and grill industry wanted to admit that they had a problem. It was very similar to the cigarette makers who didn’t want to acknowledge there was a health issue with smoking. Finally cigarette makers were forced to put warning labels on their product and in a similar fashion so were the grill manufacturers. The propane tank label warns of the potential of serious injury or even death. One company puts the required label on their grills but adds, “This is the back of the grill” and puts the warning label out of sight on the back of the grill. I decided to self-venture the covers, took out a small SBA loan to develop the covers and packaging, attended trade shows and spread the word to the press. It was well received and my story was printed in about 30 newspapers, a dozen or so magazines and a couple of TV news segments. My goal was to demonstrate that the covers were a commercially viable consumer product and then get financial backing to bring it to market. I presented at Angel investor gatherings and VC events finally found an investor who agreed to invest $300,000. Long story short the investor died a week before his 84th birthday and before he transferred the money. Next up I found a company at one of the shows I attended who wanted to license my invention. Long story short I granted them an exclusive license and then they never manufactured it. Today the exclusive license has expired and with crowdfunding a common vehicle for launching a product I am self-venturing again and this time with your help. The money you provide will go to placing an initial volume order, connecting with existing web based fulfillment and fine tuning our safety and environmental message so we can help protect lives and the world.